NHL News : Ken Hitchcock publicly calls out his team after yet another loss at home. Ken Hitchcock publicly calls out his team after yet another loss at home. Oilers coach calls out his team. The Edmonton Oilers may have hit a new low on Saturday, although it seems that has been a talking point several times already this season. The Oilers have been unable to deliver a winning product on the ice in front of their home crowd at Rogers Place for what feels like the entire 2018 - 2019 National Hockey League regular season and on Saturday they did not miss yet another opportunity to let down their home town fans. The Oilers welcomed the San Jose Sharks to Edmonton on Saturday and what a welcome it was from the Oilers as they rolled over and were largely dominated by a score of 5 - 2, another uninspired loss for the Oilers. On top of the defeat on home ice the Oilers also lost one of the players on their top line when forward Ty Rattie sacrificed his body to block a hard shot from San Jose Sharks defenseman Tim Heed. Rattie had to be helped off the ice and carried down the tunnel and was unable to point any weight down on his injured leg which is of course a very bad sign. The Oilers would confirm later in the evening that Rattie, who's injury occurred with literally less than one second remaining in the period, would not return to the contest. The big talking point from this game however may simply end up being the daggers thrown by head coach Ken Hitchcock after the game, daggers that were directed squarely at the players within his own locker room. 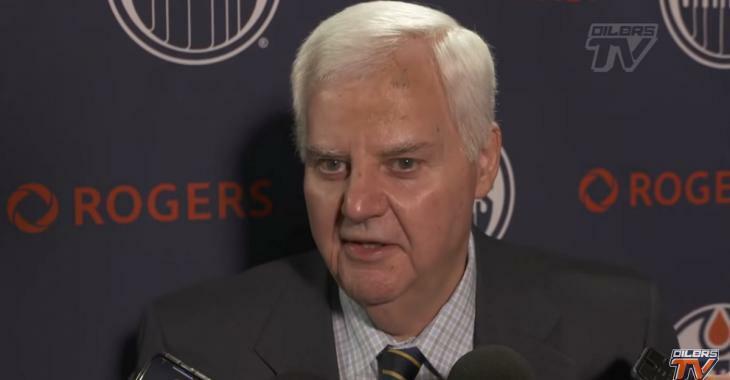 Now to be clear Hitchcock did not call out anyone by name so if you were hoping to hear him chastise a player like Connor McDavid or Milan Lucic that did not happen, but he did make it clear that he felt there was a serious lack of effort from the Oilers locker room. "At this time of year the coaches can't want it more than the players," said Hitchock following the Oilers loss to the Sharks. You can hardly blame Hitchcock for his perception of his team, the Oilers have just won 3 of their last 10 games and are currently sitting outside of the playoffs. With so few games left on the calendar to make up ground the Oilers can't afford to take a night off, and it's clear their head coach feels that is exactly what the team has delivered.